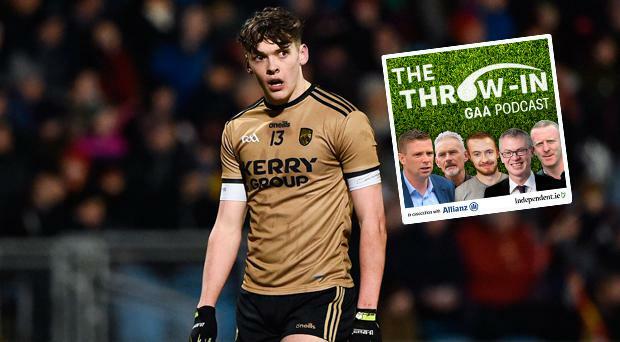 Joe Brolly has offered his advice to Kerry manager Eamonn Fitzmaurice after Kingdom star David Clifford played three games in seven days. Tralee IT manager Liam Brosnan highlighted the issue when Clifford missed a Sigerson Cup game this week, alluding that there needs to be a line drawn on the use of the talented forward. Clifford limped off injured in Kerry's 1-15 to 2-09 victory over Mayo in the Allianz League last weekend - a week after making his Kerry senior debut in their win over Donegal. In between that, Clifford lined out for IT Tralee in the Sigerson Cup and was withdrawn injured in that game also. Speaking on Independent.ie's GAA podcast the Throw In, in association with Allianz, Brolly says the demands on Clifford are too high. "Far too much, far too much (playing time). What Eamonn Fitzmaurice should be doing there is said look....he got his debut out of the way, it's grand and it's good to get him out there and to get him a feel for it. "But then he should be saying 'look this kid has got a heavy schedule. Look kid, we are going to stand you down for the next game but you are very very much in our plans. We are going to let you play your university football now and then there is ample time to get back'. "Realistically, Kerry need to be fit come the middle of June. That's when they need to be ready. "The big success story as predicted by Tomas Ó Sé is Sean O'Shea. For the second game in a row he has been absolutely devastating and looks to have cured a really problematic position for Kerry in the longer term."